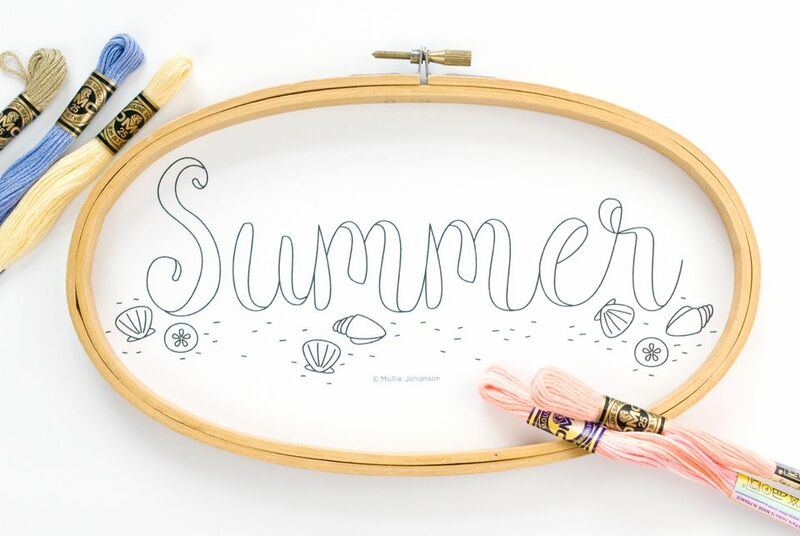 Settle in for summer vacation with this free seasonal pattern with a hand-lettered look. Between the sandy stitching and a scatter of seashells, you'll practically hear the waves as you work. Give your embroidery a watery background with blue batik quilting cotton or keep it fresh and slightly nautical with crisp white linen. A pattern like this is good for practicing your embroidered letters, while remaining a relatively quick project to finish. And although it's simple enough for new stitchers, more advanced embroiderers will enjoy it as well. This design is part of the seasonal word art pattern series, which includes autumn leaves, winter snowflakes and spring flowers. Embroider all four patterns as individual hoops or kitchen towels that you can change out for each season. You can even use all four patterns together in an embroidered quilt. Get ready to head to the beach as you start your summer stitching! Download the Summer Embroidery Pattern JPG. Print the file so it fits on a standard piece of paper with the page in landscape layout. To save time transferring the pattern, you can use water-soluble stabilizer and print directly onto the stabilizer. Note: This pattern may be used for both personal and small business embroidery projects, but the pattern remains copyrighted to Mollie Johanson. If you are using fabric that is thin or stretches easily, it's a good idea to iron stabilizer to the back of your fabric first. Transfer the pattern onto your fabric, using your favorite method. Place the fabric in your hoop and get ready to stitch! You can choose to work this pattern with any stitches you like, making it as simple or as complex as you desire. For ideas to get started, follow the following stitch guide, working with three strands of floss throughout. For the thick parts of the letters, use satin stitch, and on the thin parts, use back stitch. Use stem stitch for the outlines of the shells and detached chain stitch for the centers of the sand dollars. Add the tiny grains of sand with a scattering of straight stitch. When it's time to choose thread for this pattern, think beach colors! A sand-colored floss works well for the lettering and the scattered sand. Make the shells as natural or as colorful as you like. Real shells often have some bright colors, so don't be afraid of that. If you want your summer stitching to look more nautical, embroider "summer" in navy and use all natural tones for the shells. To get the mottled color look, try working with variegated floss or DMC's Color Variations floss. The colors shown in the sample are DMC 612, 156, 745, 3824 and 4110 (the last one is Color Variations). If you want to work in other brands of thread, color conversion charts make it easy to find equivalent colors.